A cue can be poisoned when, instead of a reward, it is paired with something the dog does not like. In dog training, we think of that as something painful, scary, or unpleasant. But we need to remember that it is the learner (in this case, the dog) who decides what is painful, scary, or unpleasant. That means something that we think is no big deal can negatively impact the dog, and poison the cue. The most common example I hear is of people poisoning their recall word, "come." Somewhere in their training, they paired something the dog does not like with the cue. With a recall, maybe calling the dog came to mean it was time to leave something fun. Regardless of what poisoned the cue, once the cue becomes poisoned the dog no longer performs the behavior, or performs the behavior slowly. Once that's the case, the trainer has to change the cue to get the behavior they want reliably again. Until recently, I've always thought of a poisoned cue as a word. But a few weeks ago I was listening to a podcast by Hannah Brannigan. She teaches here at Fenzi Dog Sports Academy, is a well-known positive reinforcement dog trainer, and has a popular podcast called "Drinking from the Toilet." In this particular episode, Hannah said she likes to use things in the obedience ring as cues for the dog. For example, she said walking past the gates into an obedience ring is a cue for her dog to turn and face her. That's not all she said, but I really liked that idea. It reminded me — a cue doesn't have to be a word, it can be any of the senses: sound, smell, sight, or touch. 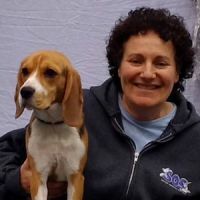 Then, a few days later, I listened to another podcast, this time from the Animal Training Academy, where the speaker, Alexandra Kurland, was talking about poisoned cues. Alexandra is an advocate for clicker training with horses, and she shared an experience she had while working with a difficult horse. She had success working with the horse in the barn aisle, but when she brought the horse into the arena, the horse could not work. The arena was where the previous trainer had "trained" the horse with punishment. Then I put 2 + 2 together. My dog suffers from what is commonly known as "ring stress." It's like she deflates once we step into the ring. The obedience ring has become a poisoned cue for my dog. That is not a good thing for an obedience dog. If the obedience ring can cue good things for a dog, it can also cue bad things. That's the cause of my dog's "ring stress." And I know what caused it — I punished her in the ring. I didn't hit her or yell at her or jerk on her leash in the ring. In training, when she didn't do what I asked (even though she "knew it"), I showed my disappointment, or took her out of the ring, or put her in her crate for a "time out." At trials, when she did not do well, I was annoyed; I was frustrated and she knew it. No jackpot for that performance. It did not take long for my dog to develop a negative conditioned emotional response (CER) to the obedience ring. It has taken me years to try to undo the damage, and I'm still working on it. I don't think my dog will ever love the obedience ring. I just want her not to dislike it so much. If your dog is not working or performing the way you would like, think about whether it's possible that you are working in a poisoned area. Think about whether something in the environment is poisoned. Better yet, be aware that you can poison an area or a situation as easily as you can poison a word.